If you're wondering how to juice broccoli I've got you covered. I’m a big fan of broccoli, whether raw or steamed. But juiced? Not as much. I’m sure you’ll agree that broccoli has a rather powerful flavor, one that becomes even more intense when served in juice form! Even if you don't like to eat it, you should try to juice it. You can make it taste palatable, and it's an easy way to incorporate it into your diet. Vitamin K: a ¾ cup of broccoli has more than 100% of the daily recommended intake. Vitamin K helps your blood coagulate and stimulates new bone development, protecting you from bruising and bleeding. Vitamin K is also needed for your body to absorb calcium, which helps keep your bones and teeth strong, while it also activates proteins necessary for cell growth. Vitamin C: A cup of broccoli juiced gives you your entire daily intake! It’s about the same amount of Vitamin C as an orange. Calcium: Broccoli has about the same amount of calcium as whole milk, making it great for those who wish for all the benefits of calcium, including strong bones and teeth! Carotenoids: The beta-carotene in broccoli breaks down into vitamin A, which helps you maintain a healthy immune system. Broccoli also contains carotenoids called luten and zeaxanthin, which help maintain healthy vision and protect your eyes from UV damage. Carotenoids can also help prevent lung cancer, according to the Linus Pauling institute. Manganese: There’s manganese a-plenty in broccoli, which activate antioxidant enzymes, which protect your cells from damage caused by toxic by-products of your cellular metabolism. It also helps you process nutrients, including proteins and carbohydrates, obtained from your diet, and aids in bone development and wound healing. B2/Riboflavin: This great vitamin supports your immune system and helps your body deal with stress. It also helps you process fat and protein, as well as helping your body process B6 and folate into usable forms. If that’s not enough, it’s an antioxidant as well, which helps fight free radicals that are created when your body breaks down food, and prevents aging. Selenium: Broccoli also contains significant amounts of selenium, a mineral that fights cancer. How do you juice broccoli to make it taste good? Just like other dark greens, like kale, making broccoli juice palatable takes a certain finesse. Here's how I've learned to make it better over the years. Keep these in mind when making your own broccoli filled recipes. 1. Don't use too much broccoli in your recipe. A little goes a long way with broccoli, so start by only using a few florets or a few leftover stalks you have leftover from your meals. 2. Juice them with watery vegetables to dilute the flavor. My favorites are cucumbers and celery. 3. Add a neutralizing fruit or vegetable, like pear, apple or carrot. On top of adding sweetness, carrot juice provides you with extra vitamin A, vitamin K and potassium, while apple juice supplies the always-beneficial vitamin C. You can even add berries for some extra sweet flavor. 4. Incorporate herbs or roots into the recipe. Juicing fresh ginger or herbs, such as basil or mint, in your recipe help mask its distinctive grassy taste. 5. Add lemon or lime to your recipe. The acidity of lemon and limes also helps neutralize the bitterness of broccoli, while making it taste really refreshing. Cut all the produce to fit into your juicers chute. 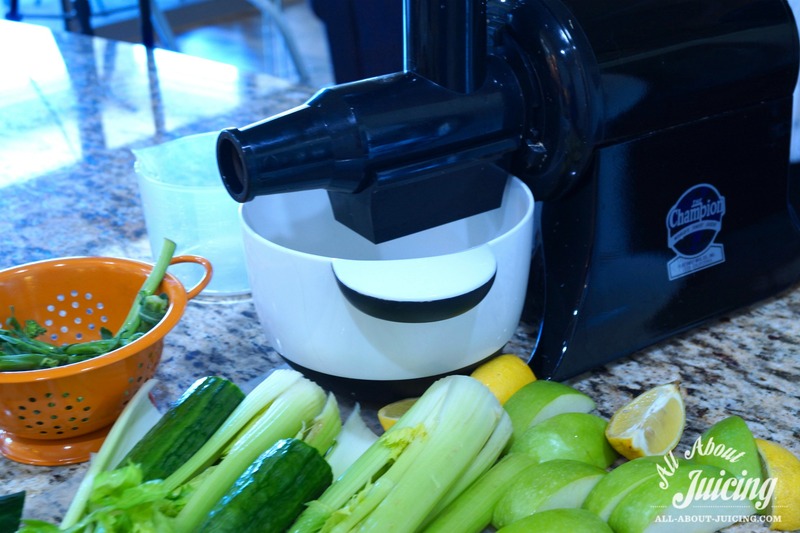 Juice the celery, cucumber, broccolini, lemon and apple. Mix gently to combine and serve. Its name, from the Italian word broccolo, relates to the flowering top of a cabbage – a tribute to its heritage. Broccoli is in fact a man-made food, a result of a mutation cultivated by the selective breeding of wild cabbage plants starting around the 6th century BC. Cross-breeding some of vegetables in the cruciferous family have given rise to newer versions of broccoli. The broccoflower, for instance, looks like a pale green-colored cauliflower yet still tastes a bit like broccoli. 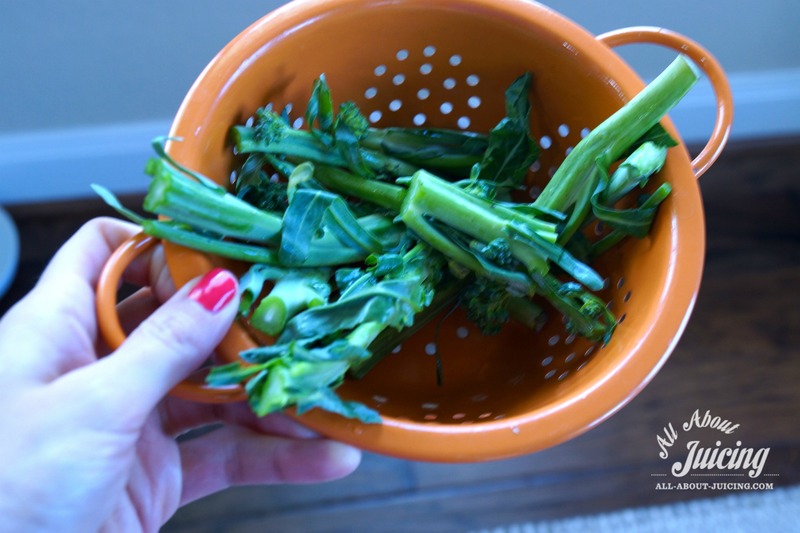 Another vegetable, broccolini, is cross between broccoli and Chinese kale which has a slightly peppery flavor. Tom "Broccoli" Landers is a world champion broccoli eater. He wolfed down one pound of broccoli in an incredible 92 seconds. Thomas Jefferson, one of the founding fathers of the United States, was a big fan of broccoli. He planted the vegetable at Monticello as early as May 1767, importing the seeds from Italy. Although known as the "golden state", California produces 90% of America’s broccoli, so perhaps golden is a misnomer for green! Broccoli is the reason the James Bond film series was brought to life. Mr. Albert R. Broccoli, to be exact. This Italian-American is credited with bringing Ian Fleming's James Bond to film. Mr. Broccoli produced all of the Bond Films made during his life and his heirs help continue the legacy. While the US enjoys their broccoli, with the average American eating 4 pounds a year according to the National Agricultural Statistics Service (USDA), the US is only the third largest producer worldwide. China, producing over 8 million tons a year, comes in at no.1.